A crop of truffles harvested by a farming couple could be one of the most significant finds in the UK for 60 years, according to an expert. About 10kg of the fungi, prized for their flavour in cooking, were found growing underground, near Little Bedwyn village on the Wilts/Berkshire border. A sample sent off to Kew Gardens for analysis has revealed the spores match the English black summer truffle. 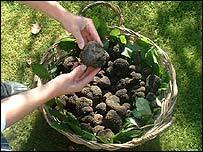 It is thought the truffles could be worth up to £3,000 on the open market. Roger Jones, chef and proprietor of The Harrow at Little Bedwyn restaurant, was the first to be contacted by the couple, who wish to remain anonymous. He identified the truffles as summer truffles - tuber aestivum - and bought a batch. Jenny Ford, spokeswoman for The Harrow at Little Bedwyn, said: "One truffle is a huge 423 grams. "The value of this one truffle is estimated to be around £150." Mr Jones then called in Roger Phillips, an international expert, to examine the find, before sending a sample of the fungi to Kew Gardens to be classified, categorised and recorded. Mr Phillips said: "We have not seen truffles in this sort of quantity in the UK in last 60 years. "It is an amazing find; I am flabbergasted at how large they are. "Some of the biggest truffles were bigger than records I have heard of." The summer truffle is said to have a nutty, crisp texture and aromatic truffle flavour. The farmer believes the spores may have travelled in the dung of some Limousin cattle he imported in from France for beef stock, during a period when he was trying a number of different methods of farming on his land. The spores are not destroyed by the gut and it is thought the most common way fungi spread is in the faeces of cattle and deer. 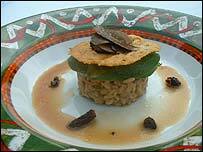 As a goodwill gesture, Mr Jones will prepare a batch of truffle risottos for the farming couple, which they intend to freeze until Christmas.